Our cover story “Illuminating a Path” was a couple of years in the making. Story development began in February 2012, a few days before the Academy Awards. Alumni volunteers from the Epsilon Xi Chapter at Ole Miss notified us of a Sigma Nu alumnus featured in a little-known documentary, Undefeated, about a high school football team in a poverty-stricken area of Memphis. Earlier that month, another Ole Miss Sigma Nu had notched his second Super Bowl MVP. In a fitting storyline, and one not unlike Brother Eli’s second Super Bowl win, Undefeated was an underdog to win Best Documentary Feature – until that point only four true sports documentaries had won the category since 1942. About one year later, February 2013, our writer Merritt Onsa interviewed Coach Courtney. Now, nearly two years after Undefeated received the Oscar for Best Documentary Feature, we’re pleased to present a powerful story we couldn’t be more proud to tell. Undefeated achieves everything you would expect from an Oscar-winning documentary. You can’t help but feel sympathy, sadness, happiness and joy for the team and its players. But the film’s lasting legacy will be its power to change how we think about disadvantaged kids that seem to be in a perpetual cycle of underachievement. As Coach Courtney explains in our story, sometimes all it takes is someone showing them the pathway they couldn’t see on their own. 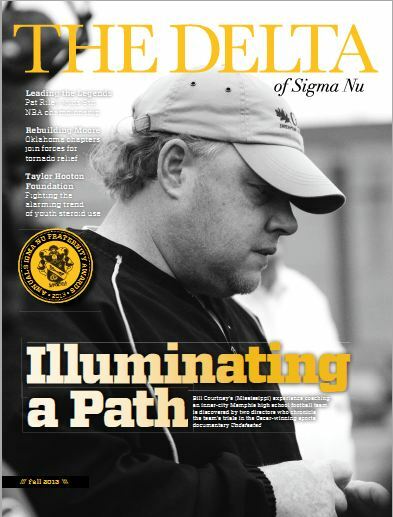 There are also moments in our cover story that remind us why Sigma Nu exists at all. That’s Coach Courtney, referring to the Creed of Sigma Nu. If you’ve watched the film you know the values he instilled in his players came straight from our Creed. “They guy who wrote that [the Creed of Sigma Nu] meant it,” he says. And as you’ll discover reading our cover story, Brother Courtney means what he says, too. P.S. We’re always interested to hear what our readers have to say. Leave your reactions in the comments section for each story and we’ll publish them with the next issue.